in ultimatum…why did bourne have to tell noah vosen…he was in his office,he should not have done that… jst cal let the mn sy his name and cut the line off…definately! Not too sure- sorry about that! Agreed- but it makes for more drama! Bluetooth handsfree devices were prevalent at the time of Supremacy & Ultimatum, but Bourne never uses them. why? all wireless technologies run the risk of being hacked and eavesdropped. a wired headset cannot be intercepted. in Identity he manages to not kill The Professor outright with a shotgun. this is *exoeptionally* hard to do with a field effect weapon, and is evidence of his proficiency. in Ultimatum he reverses off the Port Authority car park roof, and later slams a pursuing car with the rear of his own. the boot or trunk of a car is a large empty space with a good distance between the bumper and anything vital (the rear axel). sacrificing this dead space leaves him with a fully functional engine. at least for a little while. Bourne applies this strategy of “acceptable loss” to everything, even to himself – he endures physical damage (e.g. the impossible fall off the bridge in Berlin) if it improves his chances of survival sufficiently. Bourne crosses frontiers where possible in trains or boats – considerably lower security than flying. Finally, by far the greatest spy tool – and one Bourne posseses – is a facility for, and extensive knowledge of many languages. Oh, and it is Duck Tape – devised during WWII by applying adhesive to strips of cotton duck. To those saying Bourne doesn’t use a Bluetooth headset due to risk of interception that doesn’t make any sense…think about it…the phone itself is wireless so what would it matter if a 30m range headset was being used as well? I’m not too sure about that — I think a Bluetooth headset would be a less secure than a wired headset simply by introducing another way to hack the signal. Bourne tells Noah he’s in his office because he wants Vosen on him at the office and not Landy, so that she doesn’t lead Vosen to their meeting point. Also, by wasting the CIA’s time securing the floor and getting them to go back to the office, he & Landy reduce the number of people they can send exchange the file. In Bourne Identity, when Bourne realizes there’s a sniper who has most likely set up an observation post because the family dog is missing, he finds shotgun shells inside the drawer and takes a look around to see children’s toys around the dwelling. Thinks to himself, “Ok, children frequent this room so weapons may be kept up high.”. He finds and grabs the shotgun on top of a high cabinet. Blows up the gas tank outside for a distraction and smoke screen and tries to move up away from the estate. He leaves the estate property in a zig-zag as to not give away his next turn up the hill by keeping his head straight as he moves. Of course this creates a much difficult target for a sniper as they must feel and predict their target’s next move because Jason is turning at random intervals without telegraphing his true direction/heading/azimut. After making “the Professor” miss with several shots while Bourne breaks out in an all-out sprint to keep pushing position. The Professor immediately falls back to a safer location where he has 360 degree visual and is well hidden among high grass. Bourne gets to the same level atop the hill and takes a look around to see that the Professor has hidden himself well. Bourne takes a look around to assess the terrain, possible hiding locations (practically everywhere) and hears birds chirping but does not see any in flight. Bourne then takes a shotgun shot in the air to make settled birds’ (he obviously learned this from being trained in woodland areas that birds like to settle down in their flocks as well when not in flight) noise from wing flapping and screaming to flank the Professor’s position using the sound distraction and to use the bird’s directional flight to determine where the Professor’s true location is as they will immediately fly away from any human contact they visually see. Bourne can also tell by the formation of the flock in flight (scattered and squacking) that THERE IS in fact “a visitor” among the woodland terrain. The Professor, an intelligent assassin as well realizes Bourne’s tactic here and decides to go close quarters and switch to his sidearm 9mm handgun (please correct me if I’m wrong on the size of the handgun) and attempts to close with Bourne at more of a panicked state at this point in hopes of catching Bourne off-guard with his aggressive approach. Bourne after flanking, stands next to a tree as cover, waits and reloads to see the Professor running out of the high grass area. As Dermot Canniffe said in an earlier post here, very difficult to hit a target with a shotgun blast, not kill them and already know in advance it’s best to interrogate the target before they die. They ARE intelligence gatherers as well as assassins. Just wanted to add great website on a personal note, I hope it continues to attract more analyses! Delta 5-1 wonders if the prof uses a 9mm, most probably as its the most commonly used pistol round and easy to get hold of in most countries, When looking at a gun most people quote what it is and in what caliber, but by a change of barrel, spring and mag many guns can fire a variety of rounds, my own IMI 941 was in 9mm but could be converted to 10mm/Sw40AE and .45 ACP. Using the mobile phone via wire or blue tooth? wouldn’t make much difference as the phone is already transmitting its approximate position, having the number of the incoming phone is far more useful than the limited bluetooth range being picked up as the GPS signal can be traced to within 5m now days. Come on, Bourne was a super cool guy, however I do not believe that anyone can do it in a real life. Maybe some well trained person from special military forces can repeat his deeds, but I am sure that guys without special training will not be able to do that. Nice step-by-step description. Thank you. Gentlemen, When I am on TechOp I never use a Bluetooth Headset because a Bluetooth Headsets uses a rechargeable battery with a limited use period in comparison to a wired earpiece that uses no more power than the phones internal speaker and microphone. I always wondered how Bourne got the finger print of Vosen, because the safe is voice AND fingerprint activated. @david not sure, but thanks for weighing in! 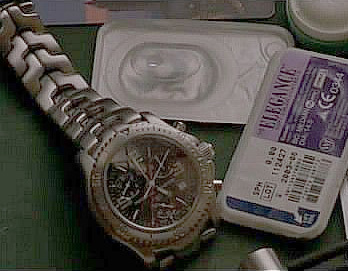 What is model of panasonic telephone in Bourne’s home that he uses after taking Marie in his home in ‘The Bourne Identity’? Further clarification: watch 40 mins 40 secs of ‘The Bourne Identity’.